Chocolate cake, chocolate ganache, and chocolate mousse team up with fruit in this incredible dessert. Begin making the cake one day ahead. Enjoy the extra mousse later. Position rack in center of oven and preheat to 350 F. Butter and flour two 10-inch-diameter cake pans with 2-inch-high sides; line each with round of parchment paper or waxed paper. Combine first 5 ingredients in medium bowl; whisk to blend well. Using electric mixer, beat sugar, eggs and egg yolks in large bowl until very thick and heavy ribbon falls when beaters are lifted, about 6 minutes. Add oil, sour cream and vanilla, then dry ingredients all at once to egg mixture. Beat at low speed until just blended, about 1 minute. Scrape down sides of bowl. Beat at high speed until well blended, about 3 minutes. Fold in chocolate chips; divide batter between prepared pans (about 3 3/4 cups batter in each). Bake cakes until tester inserted into center comes out clean, about 40 minutes. Cool cakes completely in pans on racks. Cover; let cakes stand at room temperature overnight. If ganache is chilled, microwave on defrost setting in 15-second repetitions until just soft enough to spread, stirring occasionally. Drop 1 cup ganache by rounded teaspoonfuls over each jam layer. Using offset spatula (angled blade), gently spread ganache to cover jam. Drop 3 cups mousse by heaping spoonfuls onto each ganache layer; gently spread to cover. Refrigerate cake layers 30 minutes. Using large metal spatula, place cake layer from baking sheet, mousse side up, atop cake layer on cake board. Place third cake layer, cut side down, on cake (reserve remaining cake layer for another use). Spread 1 cup mousse over top of assembled cake. Using spatula, spread sides of assembled cake with enough ganache (about 1 1/2 cups) to fill gaps and make smooth surface. Transfer cake to platter. Turn 1 large baking sheet upside down on work surface. Arrange two 20-inch-long pieces of foil on work surface. Cut two 4 1/2-inch-wide by 15 3/4-inch-long strips from parchment paper. Lay 1 parchment strip, onto each sheet of foil. Place chocolate in medium metal bowl; set bowl over saucepan of simmering water (do not allow bottom of bowl to touch water). Stir until chocolate is smooth and very warm to touch (about 115�F). Remove bowl from over water. Pour thick ribbon of melted chocolate (about 2/3 cup) onto 1 parchment strip. Using long offset spatula (angled blade), spread chocolate evenly over parchment strip, covering completely (chocolate will run over sides of strip). Lift edge of chocolate-coated strip with tip of knife. Slide hands between parchment strip and foil, lift entire parchment strip and place it, chocolate side up, on inverted baking sheet. Refrigerate until chocolate on strip is set and loses gloss but is still flexible (do not let chocolate become too firm), about 1 1/2 minutes. 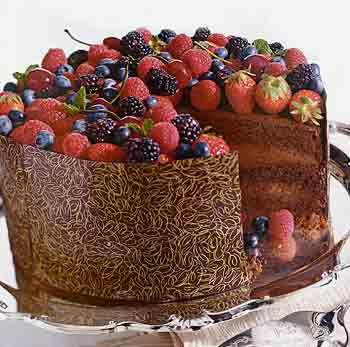 Using fingertips, lift chocolate-coated strip and attach, chocolate side in, to side of cake. Press strip to seal chocolate to side of cake (strip will stand about 1 inch above top edge of cake). Coat remaining parchment strip with chocolate, transfer to inverted baking sheet; chill until set but still flexible. Arrange 1 end of second strip against (but not overlapping) 1 end of first strip. Press second strip to seal chocolate to side of cake (both strips will just encircle cake). 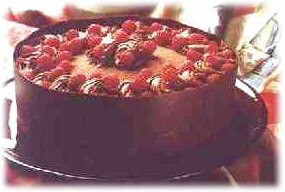 Refrigerate cake until chocolate strips are firm, about 30 minutes. Carefully peel parchment paper off chocolate strips. Chill cake at least 3 hours and up to 1 day.